The course is developed for beginners of Russian, who would like to advance their level of Russian proficiency. The course will help you to improve your speaking skills. It is a first-hand opportunity to communicate in Russian, learn about the modern Russian language during grammar and conversation classes. Emersion into the Russian speaking environment is the main principle of the course. This course is aiming at the international students, who are staying in Russia during the summer break. The course is a great chance for you to experience a special approach to active vacations. Members of the club will be offered various entertainment programs (excursions, hikes, walks in the city) and lessons of Russian in informal settings. 3. “Russian in International Tourist Business” fits best for those, who work in tourist business abroad and need to use Russian in business communication. In this course, you will also improve your conversational Russian and learn about Russian culture and traditions. The course is developed for people who use Russian as a second language, reside in Russia and look for opportunities to advance their level of Russian proficiency. The course will help you to develop speaking and writing skills. Moreover, you will learn how to write business documents, carry out business correspondence, and apply grammar, spelling, and punctuation rules in writing. 70 academic hours. Course duration – 14 days. 7 classes a day. from 9:30 a.m. to 12:40 p.m. and from 1:30 p.m. to 4:00 p.m.
- Introduction to the culture and traditions of Russia. Any foreign citizens can apply. Groups of students will be formed in accordance with the levels of their Russian language proficiency. To estimate your current proficiency level, we will use your Application Form Rus / Eng / Fr. Minimal number of students per group is 7 persons. Maximal number of students per group is 15 people. At the end of each course, all students will take a final test. By the end of each course, students will receive a Certificate of Completion issued by Ivanovo State Power Engineering University. · Students of the courses will be supplied with all course materials. Audio, video materials and various software applications will also be available at ISPEU. · A special feature of every course is an active use of slides, films, and video presentations created by ISPEU faculty and students on various aspects of the history and culture of Russia. - You need to fill out the Application Form Rus / Eng / Fr and send it with a copy of the first page of your passport with the date of your birth to rfc@ispu.ru no later than two months prior to the beginning of the course. Your passport must be valid for at least 1.5 years after the date of your entrance to the Russian Federation. - After we receive the above mentioned documents from you, we will email you a copy of Invitation. Upon receiving the copy of your official Invitation, you must provide it to the Consulate of the Russian Federation in your country and apply for a student visa. If necessary, we can send you the original of the Invitation. - You must have 3 copies of your photograph (3x4 cm.). - When your student visa is issued, you must confirm your intention to attend our course by email rfc@ispu.ru. - One or two weeks before your arrival to Russia, you must notify us by email rfc@ispu.ru about the date, place, and time of your arrival. You must provide us with your arrival information, for example the name of the airport and airline, or the train number and the city it arrives to. We will be able to meet you in an airport or at a train station only if we know your arrival information in advance. *IMPORTANT INFORMATION: You must register in the Department of the Federal Migration Service during your first three days of staying in the Russian Federation. All courses contain classes in Russian phonetics, grammar and conversation, lectures on culture studies of Russia, and practical trainings in the museums of the city. *The suggested program is tentative and can be altered or changed upon your request. 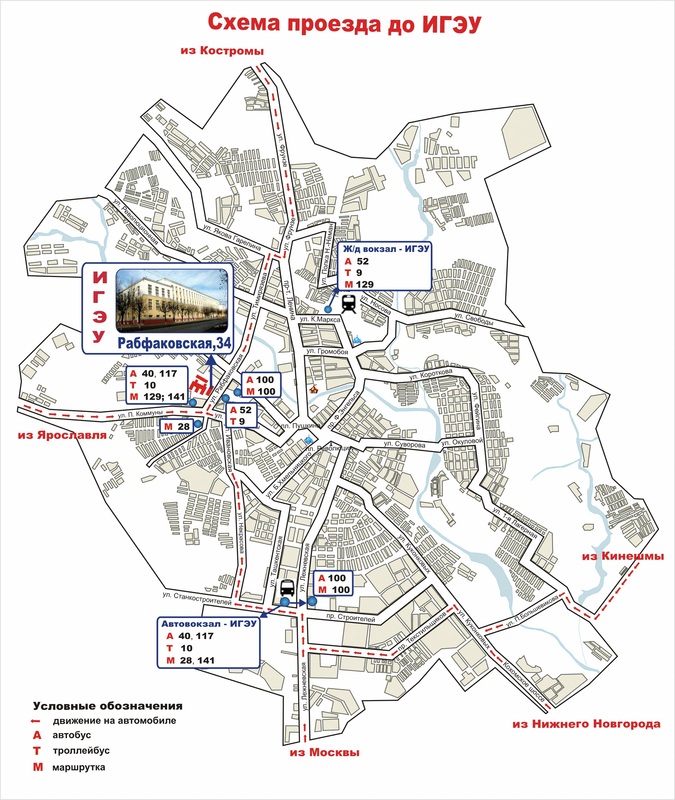 · cafes and restaurants in Ivanovo. - by van/ mini bus (12 persons; 600 roubles per person). - by van/mini bus (up to 15 persons, 300 roubles per person). · When the Course is over, we can take you to an airport in Moscow or the railway station in Ivanovo. *The prices provided here are relevant for March, 2011.